In twenty-two years in the University of West Alabama Athletic Training and Sports Medicine program, Brad Montgomery has advanced from Graduate Assistant to his current position as Head Athletic Trainer in 1998, with stops at Assistant and Associate Athletic Trainer along the way. He is a 1989 graduate of the University of North Alabama with a B.S. in Physical Education and Biology, later earning an M.A.T. in Physical Education from UWA in 1992. The Florence, Ala. native and Wilson High School alumnus is a certified member of the National Athletic Trainers’ Association and a licensed athletic trainer by the state of Alabama. Montgomery also serves as an Instructor in the Department of Physical Education and Athletic Training as well as an Approved Clinical Instructor in the CAATE accredited athletic training education program. 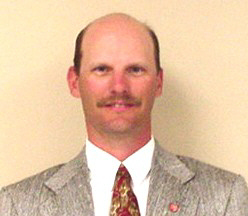 In addition to his numerous academic and professional achievements, Montgomery is currently the vice-chair of the Alabama Board of Athletic Trainers after having completed terms as the President of the Alabama Athletic Trainers’ Association, a member of the Alabama Board of Athletic Trainers, and a member of the Southeast Athletic Trainers’ Executive Board. Additionally, he received the 2008 National Athletic Trainers’ Association Athletic Trainer Service Award, the 2007 Award of Merit, the highest honor presented by the Alabama Athletic Trainers’ Association, after previously receiving the award in 2003. Montgomery was presented with the 2007 SEATA Executive Board Leadership and Contribution Award and was given the Alabama Board of Athletic Trainers Service Award for the years of 2003-2006. He has also been named to the “Outstanding Young Men of America” four times (1996-1999). Montgomery has also been selected to provide several professional presentations for the Southeast Athletic Trainers’ Association, Alabama Athletic Trainers’ Association, Mississippi Athletic Trainers’ Association, and several private rehabilitation companies. He has also served as a case study discussant at the NATA Annual Convention on multiple occasions. He worked annually on the athletic training staff of the Blue-Gray All-Star Football Classic in Montgomery, AL from 1983-1992. Montgomery is married to former Janet Koenig, Academic Coordinator for Athletics/Associate Athletic Director/Senior Women’s Administrator at UWA. They have one son, Brock 17, and one daughter, Jade 15.